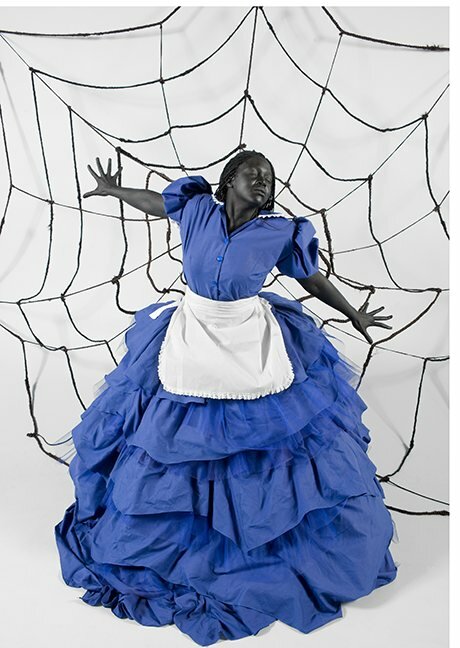 The work of South African artist Mary Sibande tells the tale of her alter-ego Sophie, a domestic worker who finds refuge in dreams where she emancipates herself from the ghoulish realism of an ordinary existence, cleaning other people’s homes. Exploring the construction of identity within post-apartheid South Africa, Sibande’s work probes the stereotypical contextualisation of the black female body. The imaginary life of Sophie is collated through a series of human scale sculptures – moulded on Sibande herself. Don’t be fooled by her seemingly calm demeanour and closed eyes, nor her large blue dress topped with a crispy white apron. This hybrid Victorian garb is in fact a gateway to uncharted elsewheres. As her working uniform is gradually transmuted into towering attires, Sophie is granted access to the glitzy world of Europe’s high-ranking monarchs and social elite; some might say, a far stretch from the ungratified life of a post-apartheid South African maid. By the magical intervention of some fairy godmother, Sophie transforms into a myriad of epic characters. A lady heading to a ball, a Victorian queen riding her horse, a general leading an army towards victory, a pope blessing a congregation of fictional devotees or a conductor waving his wand to the beat of a muted symphony. There’s even a hint of modern day fictional heroes, the likes of Superman. At times, Sibande’s reflections on female identity and social development oddly resonate with the symbolism in the literature of Lewis Carroll or Charles Perrault. Confronting the very inkling of a disempowered African female, her work aims to crack the morse code associated with western ideals of beauty and how they can appeal to black women. By way of Sophie’s mythical uniform, Sibande obliterates self-degrading notions of inferiority that could be inherent in her own family’s history or by extension her socio-cultural background. She is the first in her family to achieve academically, henceforth true freedom. Her mother and grandmother both worked as domestic servants. Poking at the power relationships between women, the art of Sibande also sheds new light on issues of race and gender. More so, it offers a counter-reference of significance to the colonial “slave & master” archetype. Her battle against injustice and ignorance through the medium of art is in itself a triumph over prejudice. Sibande’s The Purple Shall Govern is currently on view at Iziko South African National Gallery, Cape Town until 15 January. She had an artistic residency at the MAC/VAL Museum of Modern Art in France last year, where she created a groundbreaking new installation entitled A reversed retrogress. scene 2. Her work is on show in the French suburbs of Ivry-sur-Seine, Vitry-sur-Seine and Choisy-le-Roi until 28 January, with seven monumental photographic prints displayed on the streets – inspired by photographs from Long Live the Dead Queen, an exhibition in Johannesburg during the 2010 FIFA World Cup.